Here, the world's top experts impart their knowledge and experience, many in print for the first time. 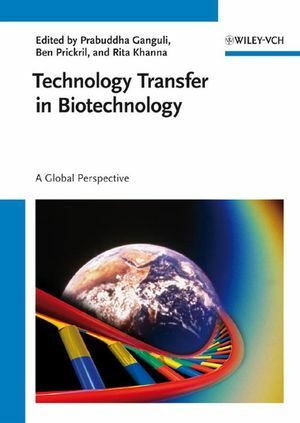 By considering developing country markets, this book is the first truly global guide to technology transfer, helping companies all around the world to avoid costly mistakes in product development and to recover investments quickly. Individual sections treat trade-related aspects of intellectual property rights, technology transfer in health and healthcare as well as in agriculture and the environment. Prabuddha Ganguli is the chief executive officer of the Vision-IPR consulting group that offers services in management of intellectual property rights, information security and knowledge management. He is also an Adjunct Professor in the School of Humanities at the Indian Institute of Technology, Bombay, and a consultant to the World Intellectual Property Organisation (WIPO), Geneva. After obtaining a Ph.D. in Chemistry from the Tata Institute of Fundamental Research, Mumbai, he did postdoctoral research in Germany as an Alexander von Humboldt Foundation Fellow, and worked in industry for over two decades, mainly in R&D and knowledge management. Ben Prickril is the former chief scientific officer of the World Life Sciences Forum BioVision, held every two years in Lyon, France. He has served as a technology transfer specialist in the U. S. National Cancer Institute and has been a biotechnology patent examiner for the U. S. Patent and Trademark Office. He has conceived and implemented the Gordon Research Conference on 'Global Aspects of Technology Transfer in Biotechnology' held for the first time in 2003, and has served as a consultant with public and private institutions on technology transfer issues. Dr. Prickril holds a Ph.D. in Bioinorganic Chemistry from the University of Georgia.